The humble bay leaf — cultivated since the beginning of recorded history, used as a symbol of honor in Ancient Greek and Roman culture, and one of the most widely used culinary herbs in both Europe and North America. Living in a cold northern climate where bay laurel trees must be grown indoors, it took me two years to find one to add to my indoor garden, and (thankfully) it was one of the few plants that survived our recent move and continues to thrive with nothing but a sunny window for light! 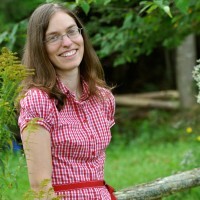 This is the second post in our Spotlight on Herbs series. My little bay laurel tree is only about a year old, but it has grown steadily from the little two-leaf sapling it was when I bought it. Potted plants can be set outdoors in the warm summer months, and moved inside after first frost. If confined to a pot, they will only grow about 6 feet tall, which is plenty big enough for me. If you live in the right climate, you can plant the tree outside in a sunny, but protected, location and eventually have a tree that can reach 65 feet tall! Use a good-quality, well-draining potting soil. Re-pot when the roots have filled the current pot. This plant doesn’t mind being in close quarters! Water well, then allow the soil to dry out between watering. You can begin to harvest leaves when the plant is a few years old. Medicinal: Bay leaf has a long history of medicinal use, which leads to a confusing number of possible benefits and uses. However, there does seem to be a body of modern research showing that it may be beneficial to those with diabetes and heart disease. Other commonly listed benefits include being antibacterial and antifungal, an aid to digestive complaints, and beneficial for most aspects of women’s health. Create a bay-infused oil to rub on sore muscles, strains, or to help with arthritis. If you have never made an infused oil before, you'll find a very thorough description here. 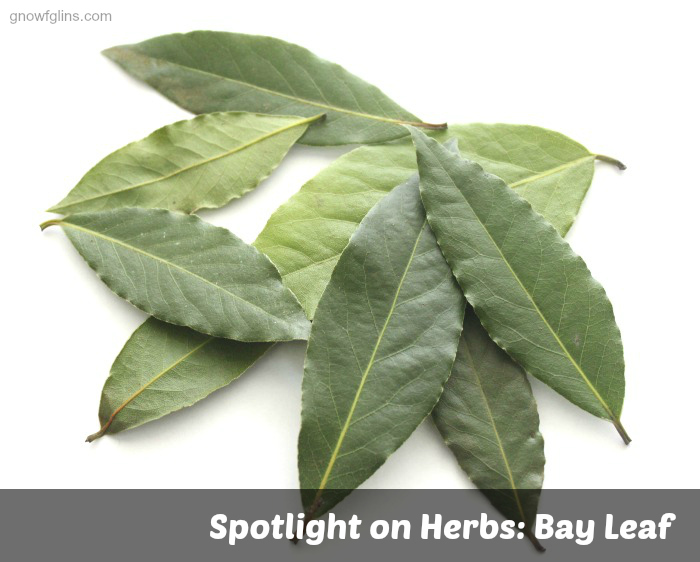 Brew some bay leaf tea to help relieve cough and congestion due to colds. 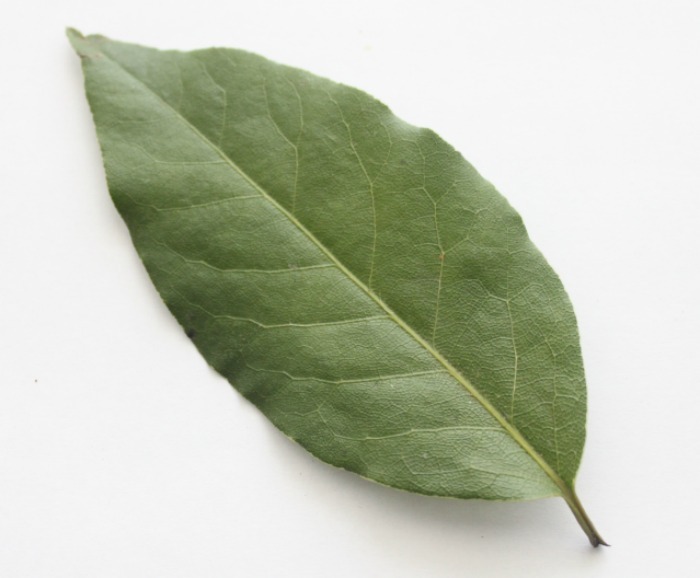 Household: Bay leaf is a natural, and effective, bug repellent. Slip leaves between the pages of books to repel silverfish. Slip a few leaves into food containers to repel moths and bugs from infesting your flours and grains. Culinary: Bay leaves are full of iron, potassium, magnesium, calcium, vitamin A, and vitamin C.
They are wonderful flavor-enhancers in soups, stews, and stocks. Stuff them into chickens before roasting, or throw a few leaves around any kind of roast. They are also a beautiful compliment to bean and lentil dishes, and I have seen them turn up in many tomato sauce recipes as well. Basically, if it is cooked in liquid, you can add a bay leaf. Just remember to pick them out before serving, as, even when cooked in liquid all day, they are still tough and fibrous to eat! A discussion about bay leaves would not be complete without mentioning poisonous leaves. Many of us were taught that we had to remove bay leaves after cooking due to the fact that they were “poisonous”. This is simply not true, since the leaves do not contain any poisonous compounds. Good thing, since we allow them to simmer in our soups and stocks all day! However, although they are not poisonous, ingesting whole leaves can have serious repercussions, as the hard sides of the leaves can actually scratch your throat, stomach, and intestines. Ouch! It should also be mentioned that there are several laurel trees that are poisonous, and, as such, their leaves should not be consumed. 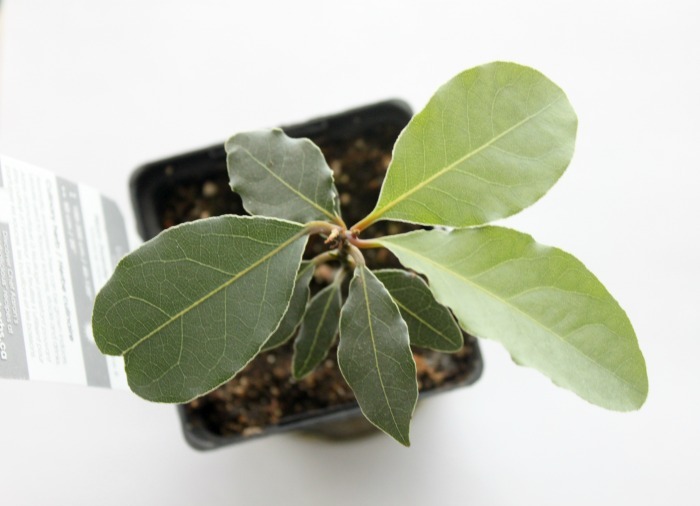 Bay laurel (Laurus nobilis) is what we commonly call “bay leaf” and is completely safe for eating. In the dark of winter, this little plant on the windowsill — and the warm herb-y flavor floating across the kitchen from the stock pot — always makes me smile. What about you? How do you like to use bay leaves? I’m so excited, I have been looking for some kind of natural but repellent. I’m going to try this. Thanks 🙂 Now only if it works to repel those pesky misquitos! I am just starting an herb garden. I am so amazed as I learn more about them how much they do! Mellissa, you have just started a grand adventure! Herbs really are amazing plants with so much history – I find the more I learn the more I want to grow! Enjoy your new garden! I love to use them! My grandmother would also put dried ones in the kitchen cabinets to repel ants. I would really like to grow one, but I don’t know that I would have a place for it inside over the winter. I tried to bring my potted herbs in this year and many of them just didn’t make it. Where do you recommend finding a sapling if I decide to try? I have not had good luck with overwintering most herbs inside my house either. However, my little Bay Leaf tree seems to be thriving. And it’s fairly slow growing, so you wouldn’t have to worry about finding a large spot for it right away. I have had mine for a year and it is still in the little pot I purchased it in, which easily sits on our narrow windowsills. As for where to find a sapling, in my experience that was a bit tricky. None of the garden centres or greenhouses within a 2-hour drive from my house sold them, and although there was one farmer who was reported to sell them at a farmer’s market in the city, I never seemed to make it there on a day when he was selling. All this to say, you might have to search a bit. I finally found mine on an Open Farm day at a commercial greenhouse that is not usually open to the public. Large scale herb company’s like Richters http://richters.com/ will mail you a sapling, if you don’t mind the extra cost of the shipping. Good luck with your search! So far I have found it to be a very easy and satisfying plant to grow. Another source for bay is http://www.raintreenursery.com They have an amazing selection of fruit, nut trees and beyond. Many are very hard to find in the USA. If you love growing your own, and like old time things and want quality stuff, this is a place worth looking into. You can request their catalog online also. Wonderful! I have been hearing a lot about bay leaves and am interested in trying to grow some. Do you know where I can purchase seeds or do I need to but a saplin? Hi Rachelle, You may be able to find seeds, but I have heard that they are painfully slow to germinate, so you are probably better off to buy a small plant. There are a few links in the comments above of places that sell the plants and will mail them to you, or you might be able to find one at a local greenhouse, or by asking other gardeners in your area. These are very slow growing. I live in a hot climate and my bay tree is only 3 feet high after at least ten years! Definitely worth investing in one – nothing beats picking your own leaves moments before tossing in a pot of comfort food. Talking about repeling bugs and flies. I teach students painting and drawing in my studio, and there is nothing worse in the summer than an infestation of flying insects. I get my students to put there used tea bags in a plastic pot and I leave a few of them by the entrance. Works a treat and I now leave them in little pots around the house. I have a large bay leave outside my studio and I am now going to try this next spring/summer as the one problem with tea bags is that the will get quite mouldy after a few weeks in hot weather. Will a skip laurel substitute for a bay laurel? It looks like skip laurel might also be called Cherry Laurel, which is not an edible variety.